The all yummy looking desserts theme today was unintentional, but these colorful homemade ice cream sandwiches were too cute not to share. 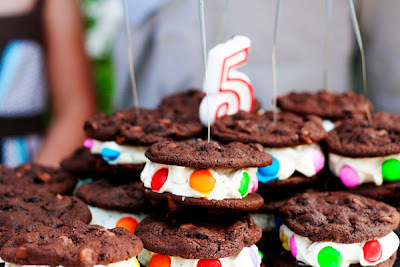 Jo-Ann created these for her daughters 5th birthday and I think they would be a fun way to celebrate the end end of the school year. You can get the recipe over at A Petty Life in the Suburbs. I know I am perusing blogs way to frequently when I find these things before you do. I am already planning to do this for my daughters birthday this week. Too cute. I am so glad that you had fun in Kentucky. Still slightly bummed it wasn't me :)! I am anxious for you to get back to your regular posting so that I don't have to spend so much time looking for cute ideas. ok...I need you to post some pictures of exercize equipment now...maybe I'll lose all the weight I've gained from just looking at these last few posts! Ohhhh - that looks sooo yummy! Thanks! I am a little behind this week!! I promise I will get bak on track soon!